Dallas, Texas-based, supersonic, intergalactic heavy rock trio Mothership give a real sense of hope that all is well in the universe, and that pure honest rock and roll has once again returned to this planet on a mission to unite true believers. Consisting of brothers Kyle Juett on bass/lead vocals, Kelley Juett on guitar/vocals, and Judge Smith on drums, these guys have created a unique sound that satisfies like a steaming hot stew of UFO and Iron Maiden, blended with the southern swagger of Molly Hatchet and ZZ Top, paired with a deadly chalice of Black Sabbath. 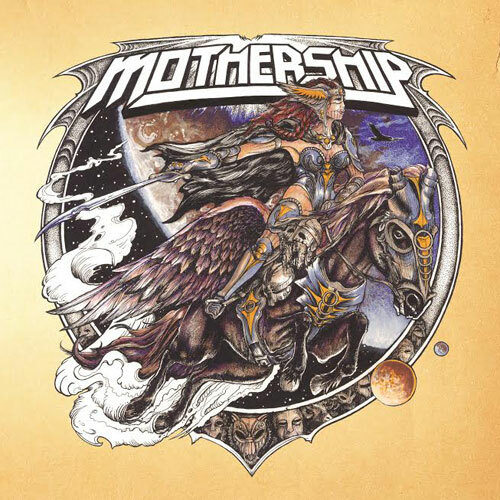 Mothership’s goal from the beginning has been to carry on the tradition of the classic rock style of the ’70′s, updated and amped up for the modern day. The band has been non-stop road warriors since the release of their debut album in February 2013 on Ripple Music successfully invading the United States, Canada, United Kingdom and Europe playing either on festival stages, night clubs, or outdoors under the sun at motorcycle parties. Mothership II, which was engineered at Dallas’ Crystal Clear Studios by none other than Kent Stump of Wo Fat, will be unleashed November 10th in Europe and November 11th in North America on both single LP gatefold vinyl and digipack CD.